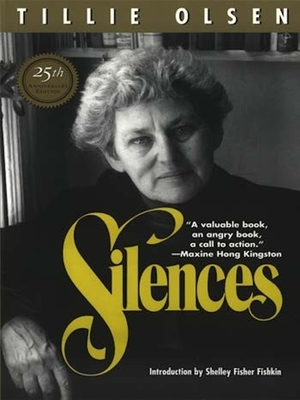 First published in 1978, Silences single-handedly revolutionized the literary canon. In this classic work, now back in print, Olsen broke open the study of literature and discovered a lost continent--the writing of women and working-class people. From the excavated testimony of authors' letters and diaries we learn the many ways the creative spirit, especially in those disadvantaged by gender, class and race, can be silenced. Olsen recounts the torments of Melville, the crushing weight of criticism on Thomas Hardy, the shame that brought Willa Cather to a dead halt, and struggles of Virginia Woolf, Olsen's heroine and greatest exemplar of a writer who confronted the forces that would silence her. This 25th-anniversary edition includes Olsen's now infamous reading lists of forgotten authors and a new introduction and author preface. Activist and author Tillie Olsen is best known for her prize-winning fiction Tell Me a Riddle and Yonnondio: From the Thirties. She taught at MIT, Stanford, and Amherst. Olsen is an recipient of an Award for Distinguished Contribution to American Literature from the American Academy and the National Institute of Arts and Letters.